The EDII or Entrepreneurship Development Institute of India is a not-for-profit organisation which was established in 1983. It was set up with a specific vision in mind- to become an acknowledged national resource institute engaged in entrepreneurship education, research, training and institution building. At EDII, the main aim is to turn out students who are competent, first generation entrepreneurs with creative genius and a strong moral and ethical code. It also aims at developing existing small and medium enterprises (SMEs) into thriving future corporations through value added management education, training, institution building and research. The PGDM-BE programme or Post Graduate Diploma in Management – Business Entrepreneurship is a full-time, residential management course with duration of two years. 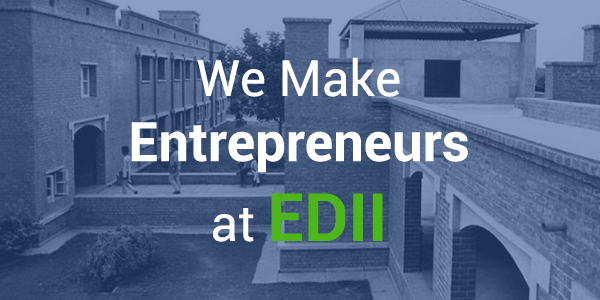 The EDII has been producing students specialised in entrepreneurship education for the past eighteen years. To be eligible, graduates belonging to general category need to have scored at least 50 % marks in graduation and in case of reserved students, only 45% is required. The PGDM-BE programme has a regular intake of 120 students per batch. The best part of the course is that students get to interact with people from diverse fields and pursuing various passions. This helps in developing the outlook of the students and gives them a general overview of the prevailing scenario. Besides, EDII helps students connect with budding entrepreneurs from across the globe through international exchange programmes. Students also get to visit foreign universities which further helps to enhance their knowledge and also build vital contacts. This post-graduate diploma in management- business entrepreneurship was specially designed for entrepreneurs and entrepreneurial managers to develop critical thinking, encourage their ambitions and business ventures, and provide students with an intellectually stimulating and invigorating management education. EDII also helps students to get summer internships working with premier organisations in order to gain some practical experience in the field. Students interested in starting their own entrepreneurial venture can also avail of loans from financial institutions associated with the EDII. The PGDM-BE course primarily aims at developing students’ entrepreneurial skills in order to enable them to initiate, expand and diversify business enterprises. It also helps to create managers for corporate entrepreneurial ventures. It also helps those inheriting family businesses to develop the skills and gain the knowledge required for them to run these businesses successfully.